Through competition between Gaelic dynasties for the lucrative port duties of Sligo, the town was burned, sacked or besieged approximately 49 times during the medieval period, according to the annals of Ireland. These raids seem to have had little effect on the development of the town, as by the mid 15th century the town and port had grown in importance. It traded with Galway, Bristol, France and Spain. Amongst the earliest preserved specimens of written English in Connacht is a receipt for 20 marks, dated August 1430, paid by Saunder Lynche and Davy Botyller, to Henry Blake and Walter Blake, customers of "ye King and John Rede, controller of ye porte of Galvy and of Slego". Situated on a coastal plain facing the Atlantic Ocean, Sligo is located on low gravel hills on the banks of the Garavogue River between Lough Gill and the estuary of the Garavogue river leading to Sligo Bay. The town is surrounded on three sides by an arc of mountains, with the Ox Mountain ridges of Slieve Daeane and Killery Mountain to the southeast bordering Lough Gill. The flat topped limestone plateaux of Cope's, Keelogyboy and Castlegal Mountains to the north and northeast and the singular hill of Knocknarea with its Neolithic cairn to the west and the distinctive high plateau of Benbulben to the north. The town consists of a medieval core with mainly 19th century buildings many of which are of architectural merit.The town has a High Street which descends from the south of the town and terminates in a market flare at the Market Cross, a pattern typical of Norman street layouts. Here it meets the east west road leading from the Abbeyquarter on the east side to St. Johns Cathedral to the west. This seems to have been the first street laid out in the town. Burgage plots of Norman origin are also evident in the long narrow property boundaries typical of the centre of the town. The only surviving medieval building is the abbey, the Holy Cross Dominican Friary built in 1252. An arched tower and three sided cloister of the Abbey Church still survive. The next oldest extant building is the Cathedral of St Mary the Virgin and St. John the Baptist on John Street. The current building dates from 1730 when it was designed by the German architect Richard Cassels who was visiting to design Hazelwood House. The cathedral contains four memorials to the Pollexfen family, maternal relatives of W. B. Yeats. In the nineteenth century, Sligo experienced rapid economic growth and therefore architectural change was rapid.This was marked by the erection of many public buildings. These include Sligo Town Hall, designed by William Hague in a Lombardo-Romanesque style. Sligo Courthouse on Teeling street is an asymmetrical Neo-Gothic building designed by Rawson Carroll and built in 1878. The Gilooly Memorial Hall is an austere building on Temple Street built as a memorial to the Temperance campaigner Bishop Gillooly. His statue above the door bears the inscription "Ireland sober, is Ireland free". The Model School, now the Model Arts & Niland Gallery, was built by James Owen of the Board of Works to provide education to all denominations between 1857 and 1863, it was to serve as a model for other schools throughout the country. Sligo has three buildings in the Art and Crafts architectural style, the Masonic Lodge on the Mall designed by Belfast architect Henry Seaver, the Yeats Memorial Building designed by Vincent Craig, also from Belfast, on Lower Knox Street and Weston House on Union Street. The former Batchelors factory on Deep Water Quay is an industrial building which was built in 1905 as a maize mill and grain silo, and used an innovative construction method invented by François Hennebique in 1892. It is one of the earliest examples of its type in Ireland. As of 2016[update], Sligo had a population of 19,199. There were 14,428 Roman Catholics in the area at census time. A further 2,102 were adherents of other stated religions (e.g. Church of Ireland, Islam, Presbyterian, Orthodox), while 1,959 persons indicated that they had no religion. Non-Irish nationals accounted for 16.9 per cent of the population of Sligo compared with a national average figure of 12.9 per cent. Polish (886 persons) were the largest group, followed by people from countries outside the EU (753 persons). The service sector is the primary employment sector in the town. The Republic of Ireland's tool making industry is centred on Sligo. [clarification needed] The pharmaceutical industry is significant with several companies producing goods for this sector, including Abbott (Ireland) Ltd, which is the largest corporate employer in Sligo. The Sligo Festival of Baroque Music started in 1995 and takes place on the last weekend of September. The town is home to 2012[update] League of Ireland Premier Division champions Sligo Rovers, who have played home matches at The Showgrounds since they were founded in 1928. Football is the dominant and most popular sport in Sligo town. The club belongs to the people of Sligo town and is the only co-operatively held club in the League of Ireland. As of 2011, 16.9 per cent of adults were educated to at most primary level only; a further 52.0 per cent attained second level while 31.2 per cent were educated to third level. Secondary schools include Sligo Grammar School on The Mall (Church of Ireland), and Summerhill College on Circular Road (All boys – Roman Catholic). Sligo's main third level institution is the Institute of Technology, Sligo, which offers a range of courses in the disciplines of business, engineering, humanities and science. St. Angela's College (outside the town proper) is a constituent college of the National University of Ireland, Galway, and offers courses in nursing and health studies, home economics and education. In total, there were 5,206 students enrolled in third level institutes in Sligo in 2011. 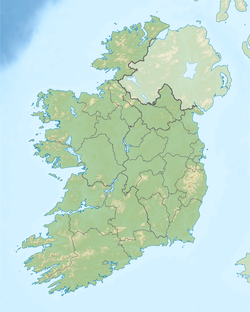 Map of the west of Ireland. 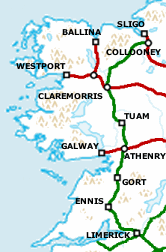 Proposed Western Rail Corridor indicated between Collooney and Athenry. Ex-GSWR line south of Limerick in green, other ex-MGWR lines are in red. ^ "Table 6 – Population and area of each Province, County, City, urban area, rural area and Electoral Division, 2002 and 2006" (PDF). Census 2006, Volume 1 – Population Classified by Area. Central Statistics Office. 26 April 2007. pp. 111–112. Archived (PDF) from the original on 29 May 2008. Retrieved 10 October 2007. ^ a b c d "Sapmap Area - Settlements - Sligo". Census 2016. CSO. 2016. Archived from the original on 13 January 2018. Retrieved 12 January 2018. ^ SCC. "ErrorFourZeroFour" (PDF). www.sligococo.ie. Archived (PDF) from the original on 6 October 2014. Retrieved 2 May 2018. ^ a b "Origins of Sligo/Slicech/Sligeach". Sligo Heritage. 10 November 2009. Archived from the original on 11 June 2017. Retrieved 1 December 2016. 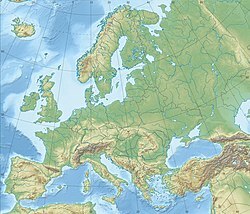 ^ "Ptolemys map of Ireland: a modern decoding". Irish Geography. 41: 49–69. doi:10.1080/00750770801909375. ^ Wood-Martin, W.G. (1892). History of Sligo, County and Town. From the accession of James 1. to the Revolution of 1688. Vol. 2. Dublin: Hodge & Figgis. ^ "Lady Erin statue". Sligo town website. Archived from the original on 13 November 2013. ^ "Charlotte-Blake-Thornley -Stoker-Bram-Abraham-Sligo-Dublin-ODonnells-Manus-the-Magnificent". www.bramstokerestate.com. Archived from the original on 23 September 2017. Retrieved 2 May 2018. ^ "County Profiles – Sligo". Western Development Commission. Archived from the original on 18 November 2007. Retrieved 13 May 2008. ^ DellaSala, Dominick A. (2 May 2018). "Temperate and Boreal Rainforests of the World: Ecology and Conservation". Island Press. Retrieved 2 May 2018 – via Google Books. ^ "Climate – Monthly Data – Markree". Met Éireann. Archived from the original on 14 October 2012. ^ "Celtic Crime: Declan Burke's Sligo". wordpress.com. 13 July 2010. Archived from the original on 16 March 2016. Retrieved 2 May 2018. ^ Brooks, Xan (20 January 2014). "Calvary: Sundance 2014 - first look review". the Guardian. Archived from the original on 6 December 2017. Retrieved 2 May 2018. ^ O'Dowd, Mary (2 May 1991). "Power, Politics, and Land: Early Modern Sligo, 1568-1688". Institute of Irish Studies, Queen's University of Belfast. Retrieved 2 May 2018 – via Google Books. ^ "All Routes". Urban Cycle Sligo. Archived from the original on 31 August 2017. Retrieved 4 May 2017. ^ "Sligo station" (PDF). Railscot – Irish Railways. Archived (PDF) from the original on 17 February 2011. Retrieved 7 September 2007. ^ Gilligan, James (19 December 2006). "Restore name to Sligo rail station". Sligo Weekender. Sligo Weekender Ltd. Archived from the original on 27 September 2007. Retrieved 3 July 2007. ^ "Timetables and Service Updates – Iarnród Éireann – Irish Rail". Archived from the original on 2 December 2012. Retrieved 18 November 2012. ^ Irish Coast Guard - Search & Rescue Archived 6 December 2013 at the Wayback Machine. ^ "Sligo City Services – Bus Éireann". Bus Éireann timetable. Archived from the original on 19 December 2011. Retrieved 28 January 2012. ^ "Intercity Services – Bus Éireann". Archived from the original on 15 January 2013. Retrieved 18 November 2012. ^ McDonagh, Marese (25 January 2017). "Bus Feda owner rejects Bus Éireann's accusations". Irish Times. Archived from the original on 10 February 2017. Retrieved 4 May 2017. ^ "Search Results - sligo quays". catalogue.nli.ie. Retrieved 29 February 2016. ^ "Tallahassee Irish Society". Archived from the original on 23 April 2012. Retrieved 18 November 2012. Wikimedia Commons has media related to Sligo. "Sligo. The capital of County Sligo, Ireland" . New International Encyclopedia. 1905.